You know how sometimes crying can feel really, really good? I knew that this book was going to be a heart jerker (it is, after all, about a pregnant 24-year-old who loses her husband), but it was so poignant, so insightful and so well written that even though I cried from start to finish, I was crying with a smile on my face. Written by Natalie Taylor, the book is culled from her journal entries following her husband’s death. It deals with grief in a way that I’ve never even considered—for example, discussing a family had to change their doorbell because the ringer was a constant reminder of the day they learned their son was killed in war. A high school English teacher, Taylor peppers her story with fresh interpretations of great literature, while also relating her fantastical adventures with a sloppily dressed fairy godmother, chats with people like J.K. Rowling and Ira Glass, and her and her son’s debut on Dancing with the Stars. 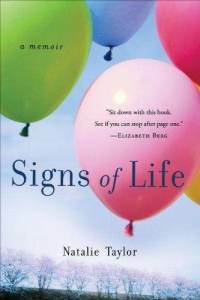 Beyond a wonderful read, Signs of Life is an excellent reminder to live life to its fullest and appreciate each and every moment we have with loved ones. Can’t recommend enough!